Senior year can be a wild ride—finalizing your list of schools, filing the FAFSA, submitting your college apps, and applying for scholarships. Read on to find out just when you should step on the gas and when you can pump the breaks in the process. But sorry, no stopping: it’s college go-time! Senior year, the year you get to sit back and coast, right? Wrong. While you should strive to create lasting memories during your last year of high school, you can’t just live in the moment. College is only a year away, so you need to make sure you are meeting all your deadlines. Remember the last time you were late to school? You had to scramble to get ready, and maybe you even sped a little on the drive over. That hectic rush is never a good way to start the day, let alone college. Instead of waiting til the last minute and needing to go into overdrive at the end of senior year, take one step at a time. This way, college preparation won’t seem like such a huge workload, and you’ll be able to enjoy your time as a senior along the way. The key is knowing what needs to be done and when. By now you’ve probably heard from teachers and school counselors about the tasks ahead: narrowing your college list, applying to college, completing the FASFA, and so on. If you are unsure of what’s next, don’t be afraid to ask your guidance counselor. It never hurts to double check, even if you think you know what lies ahead of you. Don’t be afraid to get a head start either! The earlier you finish one task, the sooner you are to checking off the entire list. Other tasks, like filling out scholarships, can be done in between the rest. Now, I know what you’re thinking: do you seriously expect me to be super proactive during the peak of senioritis? Isn’t senior year also about having a little fun? Senioritis is all the more reason to get work done earlier on in the year so when it does hit you badly, you’re not behind. Of course there will be things to do even in the midst of senioritis, but developing good habits in the beginning of the year will help at the end. And having fun is actually part of developing healthy habits. I’m not saying senior year is all work and no play. However, the perception is often that it is the exact opposite, and neither is true. The best way to enjoy senior year is to be able to discern when it’s time to work and when it’s time to play. Here’s a general guide as to which months of senior year are the most intense. 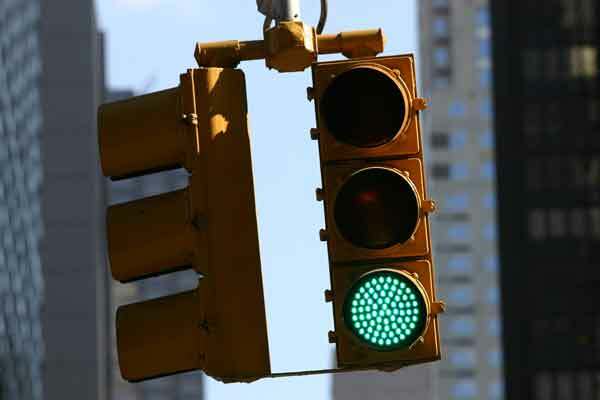 Yellow (like a traffic light) means you can go more slowly, taking your time, while green represents the need to get on something more diligently: aka, go time! I indicate the focus of the month next to the color code. The Senior Year College Application Timeline serves as the basis for this calendar, so feel free to refer to it for more information. Knowing when you’re about to approach a demanding month will help you prepare for it, and seeing a lighter load during another month can give you something to look forward to. You can take some time to ease back into school mode when September rolls around. Mostly focus on your high school responsibilities: your new schedule, teachers, and classes. As far as college goes, it’s more of an introductory month. You’ll be reminded of expectations headed your way and will need to narrow your list of colleges and register for the SAT or ACT. It’s also a good idea to begin talking to your family about what’s to come. Mom and Dad will no doubt appreciate being in the loop, and they will feel more prepared when it’s time to help you, making it less stressful for everyone involved! The FASFA opens on October 1, and while it doesn’t close until the spring, it is an integral part of the financial aid process. You may not think you qualify for much help, but a little bit goes a long way. Plus, you might receive more aid than you think. Either way, it’s definitely worth filling out—it’s free, so you have nothing to lose! Keep in mind certain states and schools have different deadlines, and aid is often dispensed on a first-come, first-served basis, so it’s best to fill it out as soon as possible. To find out when your state’s deadline is, visit the official FAFSA website. The FASFA is October’s main priority, but it’s also helpful to review and complete your college essay if you haven’t already, request recommendations from teachers (these take time! ), and attend the last of your college tours. If you are applying for Early Action or Early Decision, now’s the time to apply! If you aren’t interested in either Early Action or Early Decision, then you don’t have any major deadlines in November. But that doesn’t mean there isn’t plenty to do! Catch up on any work you haven’t already done, and begin to finalize your applications for colleges. You don’t have to worry about sending in your applications just yet. In fact, my school counselor recommended students refrain from submitting Regular Decision applications in November so they aren’t confused with Early Action or Early Decision. As long as you’ve got everything set so far, feel free to take some time off the process and rest up for the months ahead. With the holidays quickly approaching, school is probably the last thing you want to focus on, but December’s the time to send in your applications. It’s best to send in the applications earlier in the month, so that when the festivity fever sets in, you can let yourself enjoy the cocoa and candy canes! It’s a new year, so don’t drop the ball! As long as you’ve finished sending in your applications, January can be spent transitioning back into school after the holidays and taking a more serious look at scholarships. Find a way to organize your scholarship search. Some students list the scholarships they find in a spreadsheet, while others print out applications and file them in a folder. Whatever works for you, January is the best time to bring order to what can seem like an overwhelming scholarship pool. It also gives you a chance to see exactly what you need to submit for each scholarship and the time you need to ask for what you need, like more recommendations or your transcript. This way when it’s time to apply, you’re ready to go. Continue organizing scholarships and begin applying for them. You may also need to send mid-year grades to colleges, so be aware of your college’s specific needs. If you aren’t sure, don’t be afraid to call and ask! Apply for as many scholarships as you can. The last few months of senior year can be demanding, so use this last “yellow light” month to catch up and rest up! If you haven’t already heard back from the colleges you’ve applied to, you will now. Consider each financial aid pacakge you receive, and decide which college will be right for you. In the midst of relishing your last month of high school, be sure everything’s in order for college. This includes sending transcripts and your deposits by May 1, aka National College Decision Day. I recommend meeting with your school counselor once more before you graduate to make sure you’re right where you need to be going into the summer. As you can see, there’s a lot to be done senior year! You won’t have to slam on the gas into a whirlwind of stressful deadlines if you take one day at a time and follow directions. If you go when the light turns green, you can slow down to enjoy the drive during the less hectic months. Preparing for your future doesn’t have to burden the present. College go-time is part of senior year. It’s an experience we all encounter (and survive), so embrace it and enjoy the ride! Ready to have an awesome senior year?! Let us know your big plans in the comments!